A squat, insectlike contraption is set to fly untethered for the first time soon in a NASA test of technologies designed to take humans to the moon, Mars or beyond. 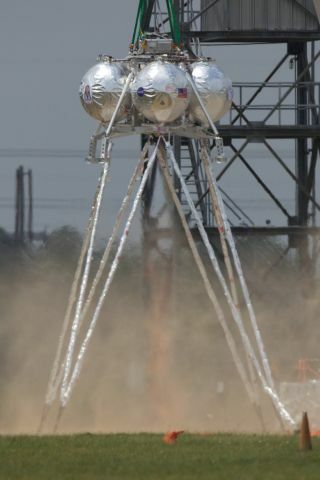 The unmanned Morpheus lander, named after the Greek god of dreams, was built at NASA's Johnson Space Center in Houston using cutting-edge technologies that the agency hopes will one day enable manned missions to another planet or even an asteroid. The vehicle, about the size of an SUV, could carry about 1,100 pounds (500 kg) of cargo to the moon. Not only are the technologies onboard innovative, but NASA's process of building the lander is, too. "Part of what this project set out to do was to question the way we've done things," Project Morpheus manager Matt Ondler told SPACE.com. "We purposefully set out to see if we could do things faster and cheaper, leveraging off the work that was already done." So far, the project has cost NASA about $4 million over the last 18 months, not counting the NASA work force, which is accounted for under NASA's general overhead. Previous missions, such as the Apollo 11 moon landing, have taught us that such a capability could be critical. When Neil Armstrong, Buzz Aldrin and Michael Collins were nearing the lunar surface on that first moon trip, they almost ran out of fuel while looking for a suitable spot to touch down. Another innovation being tested on Morpheus is a lighter, safer mix of fuel. The landing machine is powered by liquid oxygen and methane, which NASA says is a safer alternative to traditional spacecraft propellants. Not only that, but it's 10 to 20 times less expensive and weighs significantly less — an important distinction when every pound of weight carried into space requires an additional 15 pounds of fuel to get it there. Such a fuel mix might also be renewable at the spacecraft's destination. Engineers are already working on methods to extract oxygen from the lunar surface, and methane is known to exist in the atmosphere on Mars. Morpheus has already undergone several tests while tethered to a crane so it doesn't get out of control. But these haven't always gone quite as planned. One test on April 27, for example, had to be aborted after the lander started swinging wildly. In NASA parlance, "shortly after ignition the vehicle pitched over and control authority was lost," according to a NASA Morpheus blog. But the Morpheus researchers aren't discouraged, and are gearing up for the machine's biggest test to date: an untethered, free flight up to an altitude of 100 feet (30 meters), then over 100 feet to the west, then a landing. The exact date for this test isn't yet set, but mission managers expect it to occur sometime in June. "There are still a few more issues that we're working through," Ondler said. "We want to have two complete tethered flights in a row with no anomalies before we go untethered." The test will be a significant milestone for the Morpheus project. "It's sort of like taking the training wheels off," Ondler said. "If we've done everything right, it should work just fine, but there's no safety net to catch it if things don't go right." The project involves about 30 mostly full-time workers, plus another 30 part-time employees at Johnson Space Center, Ondler said. "For a lot of the people here, this is why they came to NASA," Ondler said. "It was to build stuff, to light engines off and fly things, so I think it's been very exciting for people who've had a chance to work on it." Ondler said the work on Morpheus is going so well, NASA hopes to expand the development model to more projects throughout the agency, both at Johnson Space Center and other NASA centers around the country. "Projects like Morpheus are invigorating and infectious," said Steve Altemus, director of Johnson's Engineering Directorate, in a statement. "And they help us find better and cheaper ways to do things. To challenge our existing processes. To innovate."